This painting from 1490, made by the painter and lay brother Geertgen tot Sint Jans (c. 1465 -1495) who lived in Haarlem, the Netherlands, is full of the still attentiveness of the Devotio Moderna (a religious movement in the Late Middle Ages that encouraged a close personal relationship with God). You can look at it for a long time, as at an icon, and focus your attention on one element of the work and then on another. It can help you to gain a deeper understanding of the secret of the birth and incarnation of Christ, so that it may speak to you in new ways and lead you to adoration. This was the intended purpose of the painting. The first thing that strikes us is the darkness of this canvas. The night is truly black. Jesus enters a world that is dark. This makes that he is the Light of world stand out all the more. As a bright source of light he is lying in a crib. The light that bathes this artwork in a soft glow is coming from Jesus in the manger and from the angel who appears to the shepherds in the distance. It is in fact supernatural light. Last year I combined Nativity by Night in a multimedia presentation with the hymn ‘Holy, Holy, Holy’ in the rendition of Sufjan Stevens, which appeared on one of his Christmas CD’s. In the chorus of this hymn God is worshiped with the words: ‘Blessed Trinity.’ It struck me that by letting this song be about the Christ Child, as Sufjan Stevens did, this child is honoured as part of the Trinity: the small becomes inconceivably big. Only later it hit me that Mary and three of the angels form a triangle with their hands, i.e. the reference to Jesus as member of the Trinity is also an important element in the painting! Yes, Jesus is really minuscule here - too small in fact. The sizes do not agree with each other. 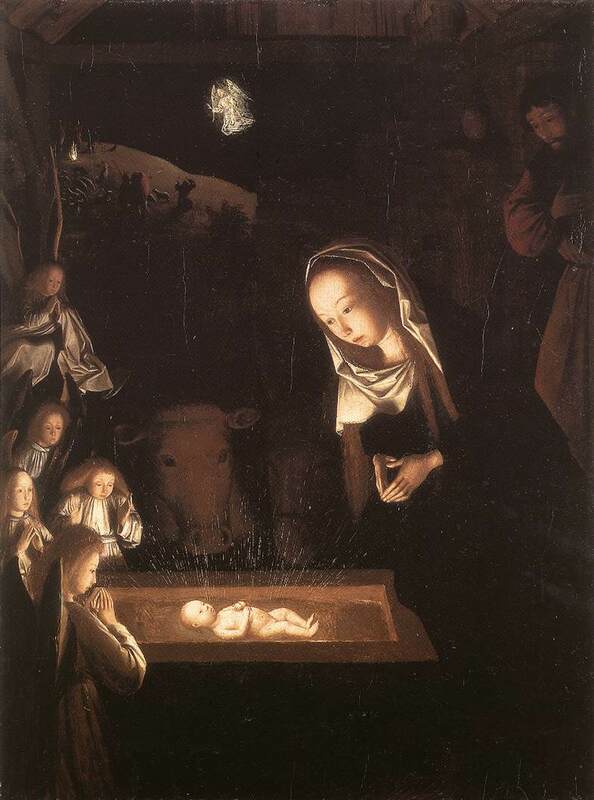 Mary, Joseph, the ox and the donkey are portrayed in a bigger scale than the child and the angels. A difference in sizes does occur more often in the 15th century, but usually it is the holy that was depicted larger than the ‘ordinary’ world. Here it is Jesus and the angels that are rendered in a smaller scale. Why would Geertgen have done this? Probably because Jesus represents the small and the weak who will conquer evil that feeds itself on prestige, wealth, power and violence. Just like Jesus on the cross is an image and example of how we as human beings are meant to be, so this child in the manger is as well. We must become like a child and know our dependence on a Father who will fill our open hands. We must become like the angels in the painting who look with childlike astonishment at that naked miracle that happens to be part of the Holy Trinity. We must become like Jesus who executes God’s all encompassing plan of redemption by becoming a human being who in his love, time and again, adopts an attitude of service and vulnerability. It was the aim of the ascetic Devotio Moderna to become ‘naked and small’ as a pillar of a devout and Christ devoted life. For whoever becomes like a child will enter the kingdom of God. The Christ Child shows us the way.